The 2014 Production opens in brooding fashion with DARKNESS. (and most powerful) Southerners’ Opener yet. Struggles often seem to last forever. Pain sometimes seems to never end. It’s the resolve to never lose hope that gets us to the other side. Strauss’s “Death and Transfiguration” provides the backdrop for the final steps out of grief on the way to redemption. Once we arrive, Wagner’s “Elsa’s Procession to the Cathedral” and the Southerners hornline herald the glorious arrival. It’s possible that no stadium will be able to handle it. As the journey comes to a close, the Southerners present a joyous finale with GLORY. The 3rd Movement of Rutter’s “Gloria” lays the groundwork for this production with its timeless melodies and infectious rhythms. A classic Southerners’ percussion feature builds to an emotional company front “push” with the “Choral Finale” from Beethoven’s Ninth Symphony. Look for the Southerners’ color guard to wash the field with intense rays of light as Tschesnokoff’s “Salvation is Created, ” takes a final curtain call and brings the production to an end. DARKNESS surrenders to LIGHT. 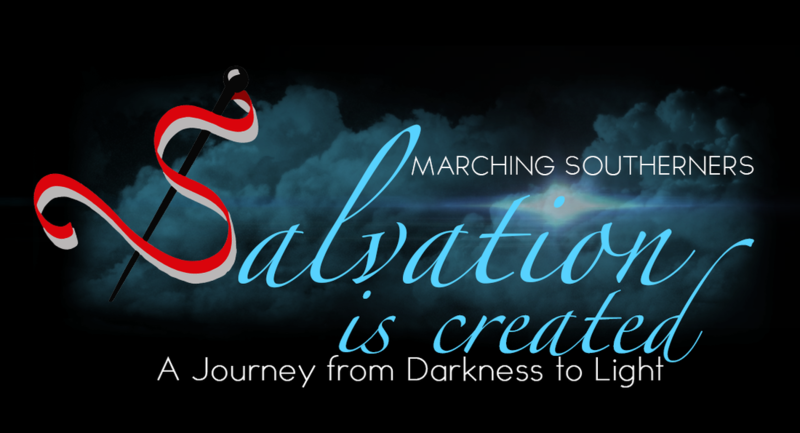 SALVATION IS CREATED: A JOURNEY FROM DARKNESS TO LIGHT. "A Journey from Darkness to Light"
If the audio is still playing, you may want to stop it or let it finish before you start the video.